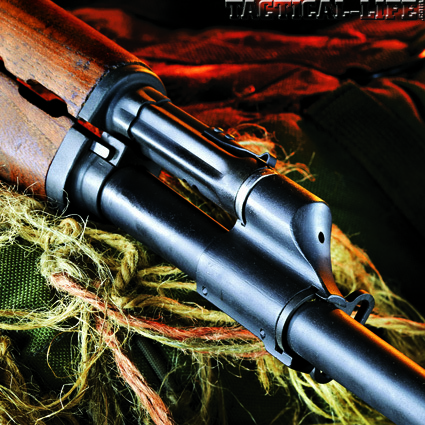 A 10-round magazine feeds Century’s version of the M76, and its AK controls and iron sights duplicate the original design. Its piston operating system gaurantees it’ll run. Since the Yugoslavian Army adopted the Mauser M48 bolt-action rifle after World War II, hundreds of millions of rounds of 7.92x57mm ammunition (more commonly called 8x57mm Mauser) were manufactured to feed more than 1.2 million M48 rifles, which were produced until 1965. With this huge inventory of 8mm Mauser ammo on hand, it made perfect sense to build a semi-automatic squad designated marksman rifle to fire it—thus the M76 was born. Several years ago, Zastava Arms began exporting the M76, which is obviously based on the AK-47 select-fire assault rifle. One American importer brought several M76 systems into the country and sold them to the public. After some were sold, the BATFE’s technical branch found a way to label the M76 as a “bad” weapon. They discovered that the M76 rifles first imported still retained the auto-safety sear feature, making the rifle a “machine gun” in their eyes, even though the M76 was never intended to be fired on full-auto. This dictum is applied to any semi-auto with an auto-safety sear or with a cutout in the receiver to accept one. Ultimately, the BATFE tracked every one of the M76 rifles down, confiscated them and destroyed them. It is speculated that the engineers at Zastava took the Communist-supplied technical data package for the AK-47 and scaled it up for the 8x57mm cartridge. Along the way, they simply ignored the auto-safety sear feature, leaving it as part of the M76’s design, even though the rifle was not intended to be used in a full-auto configuration. 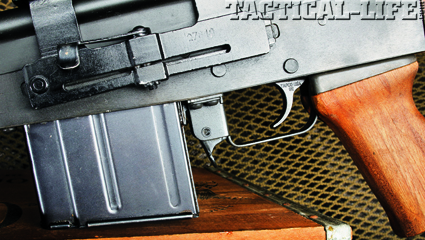 Fast-forward several years and Century International Arms of Delray Beach, Florida, has figured out a way to offer the M76 legally to the public. Steven Kehaya, Century’s engineering and product development manager, had the company mill new, legal-for-sale semi-auto receivers and make new 4140 ordnance steel barrels. 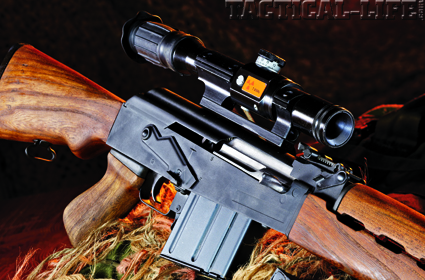 Using these new barrels and receivers, along with Tapco trigger assemblies and refurbished M76 parts kits, Century Arms has built the M76 Sporter rifle—a gun any serious Communist Bloc–firearms enthusiast will want to own. Century’s M76 Sporter precisely matches the specifications for the original M76. Without a magazine or optic, the M76 weighs 10.25 pounds. Its overall length is 44.5 inches, and the 21.5-inch, button-rifled barrel is cut with four grooves with a 1-in-9.5-inch right-hand twist rate. The upper and lower forearms, buttstock and pistol grip—the entire wooden furniture kit—is native teak. Note that either the sealing finish was removed in the refurbishing process or had never been applied. The M76 Sporter is capable of firing 8x57mm Mauser ammunition with a variation in muzzle pressure by virtue of a three-position gas regulator. It also allows the rifle to keep running when dirty. The regulator can be adjusted by rotating a ring that is held in place with a spring clip. The No. 1 position is the one the rifle was set to upon arrival, and testing was conducted without adjusting the gas setting. Attached to the front of the gas block assembly is a sling attachment point. A corresponding rear sling attachment is located on the bottom of the buttstock with two wood screws. The M76’s flash suppressor does a fair job cutting muzzle flash and stays true to older AK designs, along with the front sight. Observing the operation of the M76 Sporter, it becomes very obvious that it was based upon Mikhail Kalashnikov’s designs. When the rifle is fired, powder gases are diverted into the gas cylinder on top of the barrel. The elongated AK-style piston drives to the rear, and the bolt carrier, which is attached to the piston extension, travels back until gas pressure drops. When the bolt carrier is on its way back, it resets the hammer. 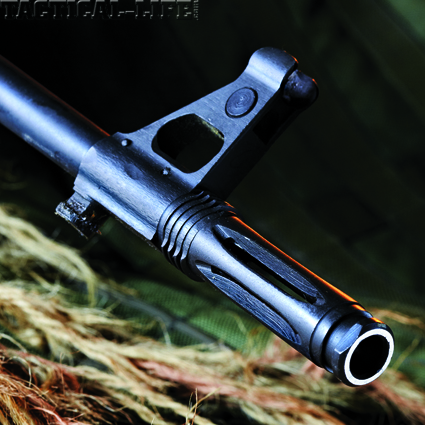 The recoil spring, which is compressed on the backstroke of the bolt carrier, strips a round from the magazine and chambers the round. When the bolt comes to rest, the bolt carrier continues forward a little more than half a centimeter while the bolt’s two locking lugs engage the recesses in the barrel extension. The trigger mechanism in the M76 Sporter finds its inspiration in the M1 Garand. Close inspection of the trigger’s mainspring reveals that it is a multi-strand twisted spring. The AK-type safety selector lever is located on the right side of the receiver. As with the AK-47, the fully up position is safe and the fully down position is ready to fire. The magazine latch is a flapper-type, and the magazines must be rotated into position like AK-type magazines. The rifle’s 10-round, sheet-metal magazines use a staggered-column, dual-position feeding style that incorporate a stainless follower. The M76 Sporter comes equipped with two magazines. 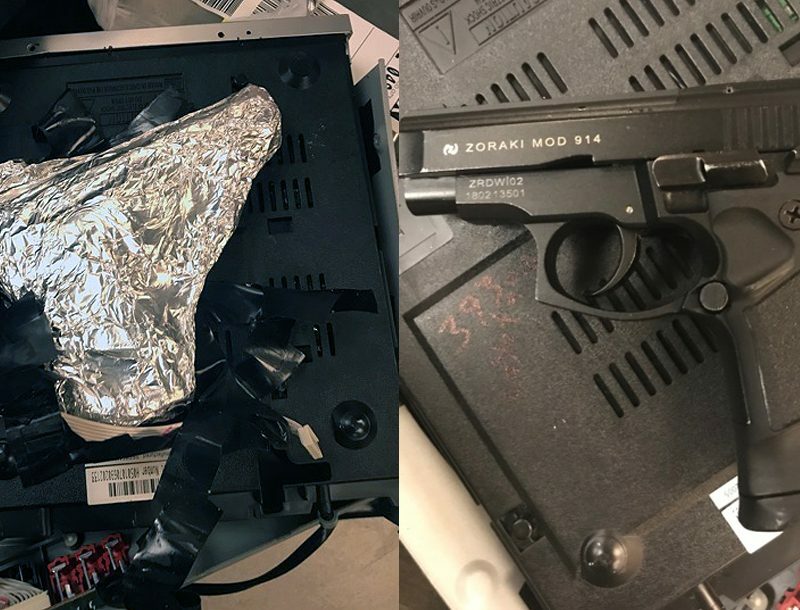 Back-up iron sights are the same found on previous Kalashnikov rifles. The front sight is threaded and has a cylindrical post with protective lobes. The front sight is adjustable for both windage and elevation, using specifically designed tools, or with a simple punch and hammer. Underneath the front sight assembly is a bayonet-mounting lug. I can’t quite fathom why a sniper rifle needs a bayonet, but the M76 Sporter has one. I guess it makes as much sense as some of the Japanese crew-served machine guns that wore bayonets during WWII. If you are familiar with the flash suppressor found on a U.S. M14 or some of the FN FAL variants, you’ll recognize some similarities to the M76’s muzzle device, which carries five equally spaced slots that do a fair job of cutting down muzzle blast and flash signature. The rear sight is a sliding tangent-type with an open notch. Like all European rifles, the rear sight is user-adjustable for elevation out to 1,000 meters in 100-meter increments. Just behind the 100-meter mark is the battle sight setting, which equals the 300-meter sighting position for the Yugoslavian M49 7.92x57mm 198-grain ball ammunition. 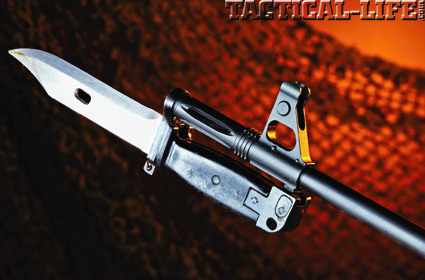 An included AK bayonet takes CQB to the extreme. Along with the pair of magazines, a Yugoslavian wire-cutting AKM bayonet is one of the accessories included with the M76 Sporter. In application, the bayonet is mounted on the rifle and the hole in the blade is indexed with the lug on the scabbard. Hook the scissor-like apparatus over a wire, then level the rifle down to shear the wire. The M76 Sporter comes equipped with an original-issue ZRAK ON-M76 scope, which is a 4X optic with a range-finding reticle layout. The top-center chevron in the scope’s field of view is used as the main aiming mark. The horizontal hash marks are for windage and lead corrections, and can be used as mil marks for ranging, too. In the bottom-left corner, a stadiametric rangefinder correlates to a 5-foot, 9-inch-tall man and can be used to determine the distance from 200 to 800 meters. Those familiar with the PSO-1 scope fielded on the Russian SVD, or Dragunov, and the Romanian PSL sniper system will recognize the source of the reticle for the ZRAL ON-M76 optic. The idea with the reticle is to put the base line at the target’s feet and the corresponding stadia will line up with his head. Then it’s just a matter of reading the distance to the target, dialing in the scope’s elevation, and putting a 198-grain boat-tailed M49 FMJ round on its way. This optic was developed with a tritium power module to light the reticle. Since the half-life of tritium is less than 13 years, it degraded below the point of illumination long ago—the lighted portion of the reticle no longer works. The ocular end of the ZRAK optic wears a rubber eyecup. Even the gas control mechanism on the Yugo M76 is the same as an AK’s, helping the action function despite heavy fouling. To mount the ZRAK ON-M76 scope, a side rail that accepts an alloy, sliding-dovetail mount with a clamping lever is permanently attached to the left wall of the rifle’s receiver. This mounting bracket also allows the use of night-vision scopes and other optics. The mount can be detached from the receiver rail quickly by moving the locking lever from the front to the rear. The scope remains zeroed when replaced and locked down. During rifle cleaning chores, the scope can be removed to allow for field-stripping and for access to the receiver cover and bolt carrier. This rifle’s AKM-type iron sights can be used with the scope in place. Curious to learn the capabilities of the M76 and its ZRAK scope, I set up a target on my 100-yard backstop. The rifle was rested on a Bulls Bag rest along with rear bags on a sturdy bench. Velocities were determined with a chronograph set 15 yards from the muzzle. Once the rifle was zeroed with 198-grain Yugoslavian M49 sniper rounds, I fired 10 five-shot groups. The M76 Sporter produced a five-shot average of 3.25 inches at 100 yards. The smallest group measured 3.05 inches. This ammunition is Berdan-primed, brass-cased and corrosive. The headstamp on the rounds varied from 1947 to 1954. Note that any shooting session with corrosive ammunition should be followed with a thorough barrel cleaning afterwards. A 10-shot string fired across the chronograph averaged 2,392 FPS (feet per second). To give the M76 a good comparative testing with American factory-loaded ammunition, I selected Winchester’s 170-grain spire-point hunting load. The best five-shot group measured 2.99 inches. Averaging four groups, this load showed that it was rather consistent at 3.39 inches. The average velocity produced by the load was 2,460 FPS. 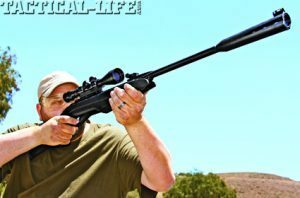 After a good break-in period, and with the right ammunition, the rifle should be capable of tighter groups. When you are ready to own a piece of history that saw service on both sides of the Balkan civil wars, then an M76 Sporter is the only way you can do it in the U.S. today. This has been a hot seller for Century Arms, owing to the desirability of this scaled-up version of the AK-47 in a sniper platform. If your local dealer doesn’t have one in stock, they can put one in your hands in short order. 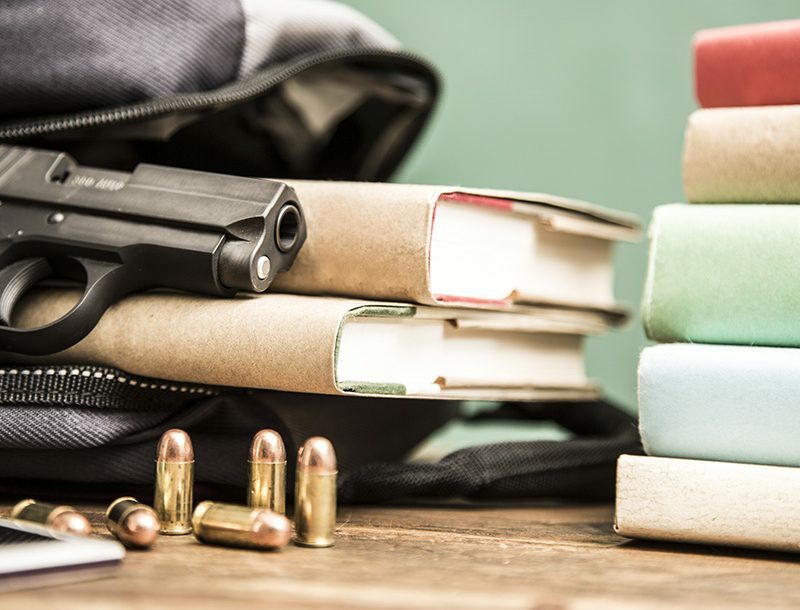 For more information, visit centuryarms.com or call 800-527-1252.